In Africa, it is said, “Water Is Life,” and we at Healing Hands International believe that everything starts with water. How far do you walk to get water? Four miles? One mile? Or is it just a few steps to the faucet? On average, a child dies every 21 seconds from water-related illnesses. More children die every day from dirty water than from malaria, aids, and measles COMBINED**. 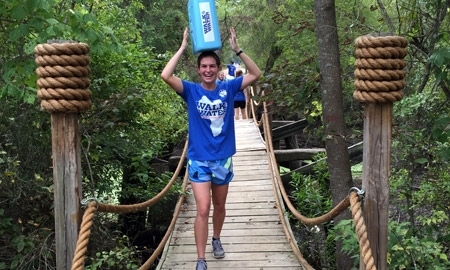 Walk4Water is a four-mile fundraising walk that began in 2007. Each event is unique and whether hosted by Healing Hands International or our partnership with you, the focus is to bring the life-saving gift of clean water to those who need it so desperately. Since the beginning of our water-drilling efforts in 2001, HHI has drilled over 600 clean water wells, bringing the gift of clean water to more than 1 million precious souls. First, register to walk at one of the events currently scheduled. You may register as an individual or create a team and invite your friends to join you! Share with your friends on Facebook, Twitter, and Instagram. We also think that good old-fashioned face-to-face conversations work! Let people know that even the smallest gift can make an impact. A simple $1.66 can make a difference. Finally, join with others in walking 4 miles in honor of those who have to walk 4 miles everyday. If you’re up to a real challenge, try carrying a jerrican with 5 gallons of water while you walk. You will be surprised how difficult this is! 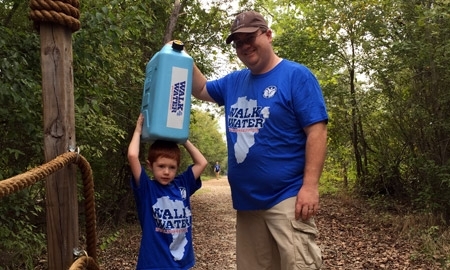 Join the Walk4Water event in The Colony, Texas October 29, 2016.